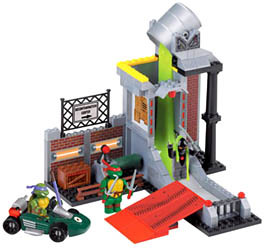 Build the Teenage Mutant Ninja Turtles urban ramp and drainage basin playset with Donatello. Perform extreme stunts with Raphael and the Turtles Go-Kart. But beware of the Ninja Foot Soldier and the falling barrel of Ooze. Contains 125 radical pieces including 3 micro construction action figures, weapons, stunt stick, Go-Kart, and real Ooze. Ages 5 and up. Connect the Kawabunga Collection.